APIs, intermediates, and drug products are manufactured according to the stringent cGMP system. Fuji Chemical has continuously passed FDA inspections 9 times since 1981 and acquired high ratings for GMP control. Production is carried out according to cGMP system covering raw material acceptance, production facility, and quality control. 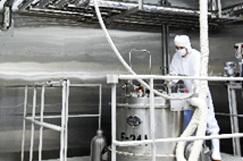 our GMP control is thorough and superior as reflected from various successful inspections.